Sale on casual leather jackets and coats for men and women, save on mens and womens casual leather jackets and coats, Motorcycle Gear Superstore. Casual jackets and coats made from leather are a top choice for consumers. A casual jacket or coat made from leather is durable and will hold up to most conditions. Shop for men's and women's casual leather jackets at the lowest prices on the market. We are your number one source for high quality casual leather jackets and casual leather coats. 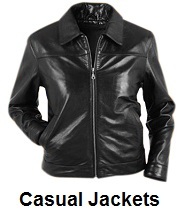 You will find the lowest prices on all our casual leather jackets and coats. 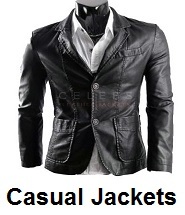 Casual leather jackets and coats are available in many styles. Shop for men's and women's casual leather jackets and coats, some styles include hooded casual jackets, reversible casual jackets and leather coats. Find all the latest styles and the best prices on casual leather jackets and coats at the number one source for men's and women's casual leather jackets. All our casual leather jackets and coats, come with a 30 day unconditional return policy. Just return any casual leather jackets or coats, within 30 days and we will grant a full refund. Thank you for shopping with us, we appreciate your purchase of a jacket.